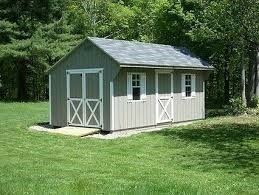 Accessory buildings include sheds, garages, gazebos, swimming pools and other structures that are detached from the house and are 36 square feet or more in floor area. Minor structures like play equipment, arbors and opaque fences are not considered accessory buildings; nor are bird houses, dog houses or playhouses that are under 36 square feet of floor area. Up to two detached accessory structures are permitted in the rear and side yards only. Cannot be closer than 10 feet to the principal structure. Cannot exceed 15 feet in height. Cannot occupy more than 20% of the rear yard area. Buildings that are 150 square feet or less of floor area cannot be closer than five feet to any lot line. Buildings that are over 150 square feet in floor area cannot be closer than 15 feet to any lot line. The composite total square feet of all detached accessory structures cannot exceed a maximum of 720 square feet of ground area covered. Scaled drawings of the design. Samples of the colors & materials. Survey or scaled drawing of the property with lot lines, existing structures & easements and proposed structure. Visit the Licenses & Permits page to download application forms. Note that homeowner’s associations such as Wind Meadows may be more restrictive when it comes to accessory structures and it is recommended that you review its bylaws or contact the association before planning to build an accessory structure.